The following blog explains the product profile concept, and shows how you can check whether your content is supported on your SAP Process Orchestration system. Before deploying the cloud integration content, you first need to check for which SAP Process Orchestration release and SP your content may be potential supported. This depends on the feature coverage of the particular release. Here, we have introduced the so called product profiles that allows you to use cloud integration content for different target integration platforms. 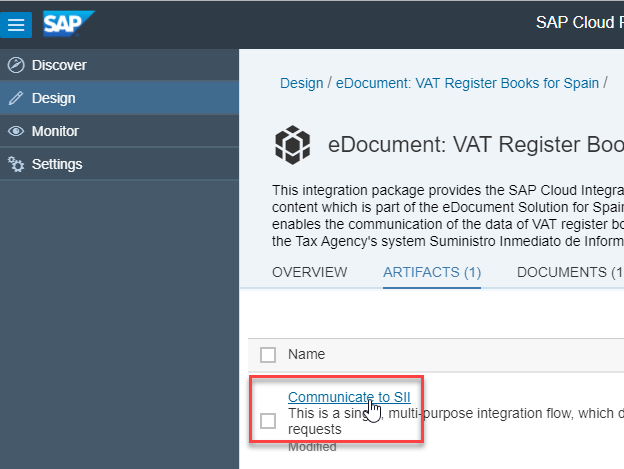 A specific product profile restricts the configuration of an integration flow to the set of adapter types and integration flow steps that are supported for a particular release and SP of SAP Process Orchestration. Currently, we do support product profiles for SAP Cloud Platform Integration and SAP Process Orchestration, for latter we distinguish the various SPs. 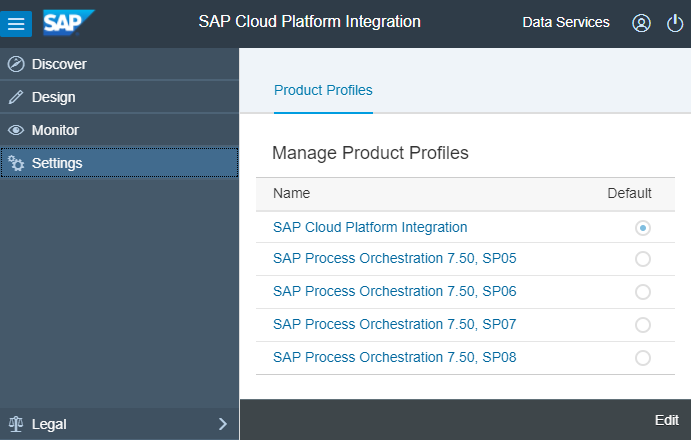 If you like to create or run an integration flow for your particular SAP Process Orchestration release and SP, you need to select the respective product profile. When you create an integration flow from scratch, a pop up comes up where you can select the product profile from a drop down menu. For an existing integration flow, you can switch the product profile on the Runtime Configuration tab of the integration flow. In any case, this has two effects. First of all, the modeling palette only shows those integration flow steps and adapters, to be more precise the particular version of the integration flow steps and adapters, which are supported for the chosen SP. Secondly, while saving an integration flow, checks are carried out, and errors are displayed in the modeling editor if a feature is used which is not supported. In case of an error marker, choose the next higher product profile version. You may eventually update your SAP Process Orchestration system. Ensure that the SAP Process Orchestration product profiles are enabled on your tenant. If this is not the case, you need to add the value igwpro to the parameter enabled.profiles in the tenant configuration. This can only be done by a tenant administrator. In SAP note 2428801 – FAQ: Cloud integration content in SAP Process Orchestration (PI), we describe how you can request that the product profiles are added to your tenant. In your SAP Cloud Platform Integration tenant, switch to the Settings area. Note, only administrators can see this tab. If the enabled.profiles contains the value igwpro, you should see all the SAP Process Orchestration versions in the list of product profiles. We do support product profiles from 7.5 SP5 on. In the following, I use an eInvoicing integration scenario to show the supported product profile capability. Switch to the workspace of your tenant by selecting Design from the navigation pane, select the respective package, and click on the integration flow. In the integration flow editor, switch to edit mode by selecting Edit on the upper right corner. In the properties section of the integration flow, switch to the Runtime Configuration tab. By default, the SAP Cloud Platform Integration product profile is set. 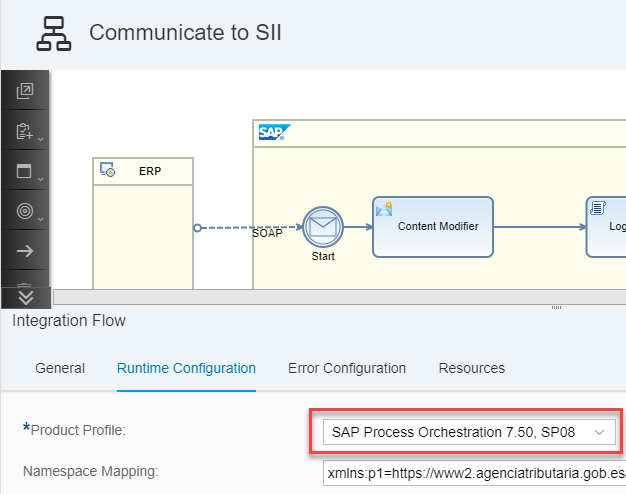 Select an SAP Process Orchestration product profile from the drop down menu, here we have chosen 7.50 SP07. If the Integration Flow is not supported for the chosen product profile, an error marker is displayed within your editor. If you mouse over the error marker, more details are displayed. In our case, the Integration Process component with version 1.1 is not supported in 7.50 SP07. We do support version 1.0 only, support for 1.1 has been introduced with 7.50 SP08. If you change the product profile to 7.50 SP08, and save again, the error marker is gone. I dont have option to set up new Product profile in settings. could you please suggest me. I was assuming that task configuration “Configure Process Integration” in HCP enables the Product profile. is it always a new ticket for new Product profile for PO system?